The first time I had a paczki was a few years ago. My friend Dobra owns a successful Polish bakery here in Chicago and she had invited some folks over to her bakery to learn all about paczki. Here's a link to that fun and delicious day. Fast forward a few years, I decided to try my hand at making them at home. Perhaps they're not quite as perfect as Dobra's but they're still pretty wonderful. I filled them with raspberry jelly but I plan on making them again soon to try out other flavors. 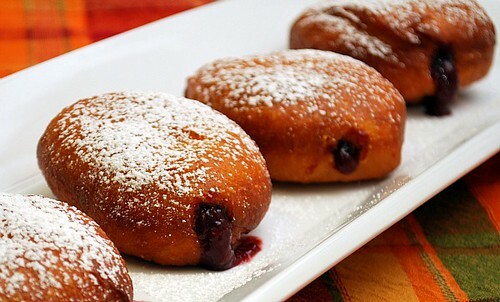 If you've ever wanted to make homemade jelly filled doughnuts, I would definitely recommend this recipe! * If making the gluten free version, you only need to let the dough rise/rest once so continue on to the next step. No need to let the gluten free rise for 1 hour as stated in the previous step. Fry the paczki, two to four at a time (depending on the capacity of your pan) for 3 minutes on each sideor until they're a deep brown, but not burned. Transfer them to a paper towel lined cooling rack to drain. When the paczki are cool enough to handle, fill them with about 2 tablespoons of raspberry jam or jelly each. An easy way to do this is with a cookie press pr pastry bag equipped with a filling tube. Or you can use a thin spoon and make a hole in the doughnut and spoon the jam/jelly in the middle. After filling, roll the paczki in sugar. Hello baybeh!! Wow, those look yum! Oh my they look like they pack a punch! These Raspberry Paczki look soo dam delicious. I wonder what it would taste like with Jelly rather then jam? I would think jam would be the most common filling. Have you make these in a gluten free batch? If so, what flour(s) do you like to use?